Marvel sent me a copy of Essential Avengers Volume 7 [$19.99], which reprints issues #141-163 of the series, Avengers Annual #6, and Super-Villain Team-Up #9. Among the 480 pages of 1970s action included in this hefty black-and-white tome are two issues I wrote back in the day. When I read stories I wrote nearly 35 years ago, usually for the first time in decades, I generally have a variety of reactions ranging from abject embarrassment to "that was okay" to "that was really good." 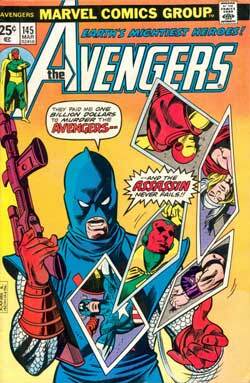 This two-issue story - "The Taking of the Avengers" - definitely falls within the middle range, though most of what I most dislike about it came from editorial dictates of one sort of another. Set the Wayback Machine for 1974. While Roy Thomas was still the editor-in-chief at Marvel and while I was starting to contemplate leaving my own editor's gig to write full time, he and I had a conversation with John Verpoorten. Marvel was consistently running into deadline problems...and I was responsible for a few - but only a few - of those along the way. But I'd helped John and Roy deal with several deadline woes as well, and we thought there might be a more efficient method of overcoming future problems. I was a fairly adaptable and fairly popular young writer. I knew the Marvel characters well and I could be counted on to come up with stories that fit the ongoing continuity or circumvented it in benign ways. John and Roy thought it might be a good idea if I started writing non-scheduled fill-in stories for use as necessary. Stories like this were done before I came along and after I left. And I'll be the first to proclaim that Bill Mantlo was a whole lot better suited to the job than I was. Someone, probably John, decided Giant-Size Avengers was a matter of some concern. Regular writer Steve Englehart had moved to California. In those pre-Internet days, coast-to-coast mailing time had to be considered. I'd already filled in for Steve on some other titles - Captain America, Incredible Hulk, and Hero For Hire - often working from plots by Roy. Knowing artist Don Heck was waiting for work, I was asked to plot a 33-page story for him as soon as possible. I set myself several "rules" in coming up with the story. Use the big guns to insure reader interest. Don't tie the story to any specific recent or future developments. Tie up all the loose ends so that the story was complete unto itself. These "rules" actually made my job easier and the plot was completed in a few days. But my story would end up going through Roy's successors - Len Wein and Marv Wolfman - before it saw print. Which brought with a couple of unexpected problems. Len used to get funny notions that made sense to Len and only Len. Like when he proclaimed, against all evidence in the actual comic books, that Luke Cage didn't have super-strength. Or, when, as the sitting writer of Fantastic Four, he said all super-hero teams had to have five members. Or when he insisted that, in spite of Gentleman Ghost creator Robert Kanigher having written a supernatural origin for the villain, the character was a living man posing as a ghost. You get the picture. In the case of "The Taking of the Avengers," Len decreed that Captain America could not be shot and critically wounded by a gun. I'll let that sink in for a moment. The second editorial bump in the road wasn't completely next-editor-in-line Marv Wolfman's fault. 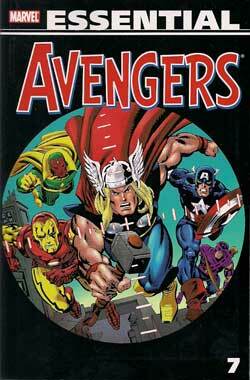 Giant-Size Avengers had been either canceled or turned into a reprint title. If my story was to run, it would have to be in the regular monthly Avengers. To make matters worse, the monthly title, then in the middle of an arc changing the team roster, was running extremely late. My story had to be pressed into service quickly. The basic plot of this story was...organized crime puts out a contract on the Avengers. Its subconscious inspiration was likely Maggia boss Count Nefaria as he appeared when he first challenged the team. I had a begrudging admiration for ordinary villains who could give "Earth's Mightiest Heroes" a decent fight. I wanted to do something similar. The splash page was a "scripting assist" credit for my friend Scott Edelman. When the story was put on the schedule so quickly, I was concerned about the deadline and asked Scott to do some sort of rough script on some or maybe all of it. For whatever reason, and no disrespect toward the fine writer Scott was and is, I wasn't happy with his work. Maybe I was just being finicky. In any case, I didn't use what he wrote and paid him some sort of kill fee. As always, Heck's pencils were easy to script. Looking over the first half of the story, I'm happy I was able to get across how important Captain America is to the Avengers and how ruthless the hired hitter was. It's not evident in the art, nor was it meant to be, but the body count gets into the double digits before the end of the story. When my story was rescheduled for two regular-sized issues of The Avengers, I had to write three new pages to fill out the required page count. I've never been happy with those new pages. No one at the office could tell me who would be in the new Avengers roster. So I went with the heroes I thought might gather together to give each other comfort and support in this time of crisis. It just created more problems for the continuity buffs, as did the big ugly caption on the first of the three new pages in which someone in editorial went out of their way to draw reader attention to the situation. We would have been far better off with a small caption explaining that this adventure took place before Englehart's then-current story. Hindsight, you are a cruel mistress. The medical business in this issue bothers me more now than it did then. The section of my original plot involving Dr. Don Blake operating on Cap made more sense when it was a gunshot wound, but I think I covered the editorially-mandated change pretty well. I'm less sure about how Hawkeye survived being poisoned, but I confess I love the idea that he was saved because he tossed his cookies in the nick of time. Ditto that Tony Stark's synthetic heart was his salvation. Were I writing this story today, I would reach out to doctors I know and perhaps get more convincing medical-speak. But I don't think I did too badly. The dire fates that befall the hitter and other characters in the story's final pages were born of my desire to throw a few more shocks at my readers and also to make the story as self-contained as possible. Sequels and returning villains have long been part of super-hero comics, but I'm a big believer in changing that up with frequent really-done-in-one issues. I hope you enjoyed this blast from my past.